Intermodulation products cancelation , IPC. Each linear regulator can be simplified to look like the block diagram of Fig.1. 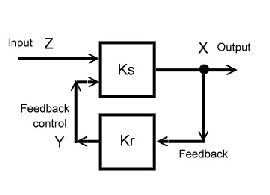 The control block Ks and the feedback block Kr. Ks may be a machine; a power device or a frequency mixer. 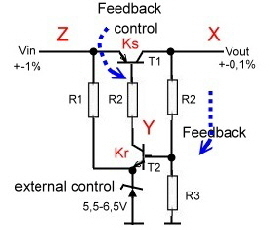 Kr is the feedback amplifier including phase and offset networks. Fig.1 This is the basic schematic of each regulator.The input Z is the unstable value which has to be regulated. The output X is the stabilized value of Z. Then there is the feedback path which controls Z via the control value Y. The input value Z can be a voltage, a frequency , the speed of a machine, a.s.o.The control value must not be the same type a the Z value. But can be a voltage, a frequency, a current or a digital byte. Fig. 2 Simple voltage regulator. Now, we look to the circuit of the simple DC voltage regulator of Fig.2. Transistor 1 is the control block, transistor 2 the feedback amplifier. The Input voltage is Z, the output voltage X. The base current of T1 is the control value Y. If the input voltage does not change we have a stable balanced condition, which is inticated by this big letters, X,Y, and Z. But this values may change if the input Z changes a small amount dz. The other values then will have the deviations dx and dy. This deviations are considered very small. compared to the stable condition values. Fig.3 Basic regulator schematic to compute feedback formulas. dx/dz = Kz / ( 1-KrKsKm). KrKsKm is total loop gain ; Vo = KrKsKm . If Vo >> 1; dx = dw. Regulation quality depends on Vo . This makes it clear, to the loop gain has to be as high as possible. This general Formula is valid for Kz or Ks including filters or V or any electronic circuit which is connected as the definition of Fig.4 shows. . The input of the driving source is zero and the load resistance is infinite.This is true for low frequency OP-AMP circuitry. As the main regulator equations are expressed as function of the frequency it is obvious, that to work with and design a feedback circuit, means to analyze and compute equations like F(s). To ease this work we express F(s) in terms of multiplicands to ease the writing of a computer program and to work graphically in a bode plot. The multiplicands M1 to M5 are standard expressions and can exist in n numbers. M2 = Second order . Bode plot values of the denominator: Gain = -40 dB/Dekade . Phase = 0 to -180 degree. 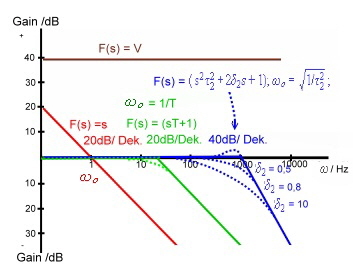 Bode plot values of the numerator : Gain = 40 dB/Dekade . Phase = 0 to 180 degree. M3 = Integrator or Differentiator: . See: F. Frauenberger , Regelungstechnik Teubner Verlag 1967. Better is to use a linear circuit analysis like LISA to compute the time behavior of circuits. In case of known time behavior the frequency behavior can be computed using Laplace transformation: or use Laplace transformation tables or software. Gain of Vo(s) at the frequency where the angel is -180 degree (total phase than would be 360 degree): G(-180) = -3 to -20 dB. Gain versus frequency of Vo(s) must cross the 0 dB line very flat. Gain of Vo(s) must be very high at the maximum regulation frequency or speed. Add this S- parameter circuit to the regulators analyzing LINA (linear circuit analysis, for instance “ Analyser Pro.... Number 1 Systems” ) circuit file. Change Parameters in the FORTRAN program and see how the results fit to total circuit running LINA and vice versa. This ProgCad method allows too, to design the feedback of regulators in the time domain using time CAD programs like LINA for circuits. The kind of transmission in a regulator circuit or a regulator block is standartisized to get a fast overlook of regulators behavior and quality. DC and low frequency gain. 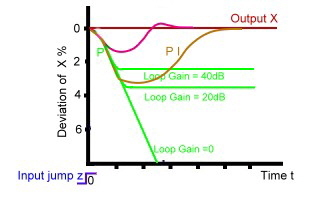 The DC and very low frequency gain is called the proportional behavior “ P ” of a regulator. Low pass behavior and Integrator are roughly called “ I ” behavior of a regulator. 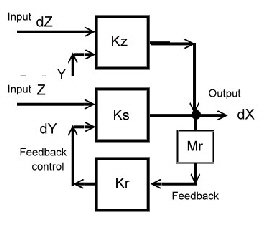 High pass behavior and differentiator are roughly called “ D ” behavior of a regulator. dx(s)/dz(s) = Kz(s) / ( 1-Kr(s)Ks(s)Km(s)). 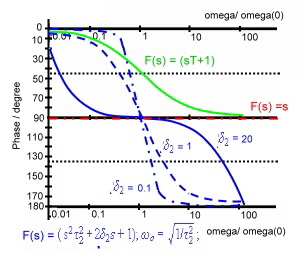 At Fig.1 the typical output x is shown of different regulator equation types after a jump in the input.. In case of only P type (green),), the output X will never reach his old value. This is the steady state P deviation. In case of I type (brown), it takes a long time until the old value of X is reached again. But this I regulator type has at least no deviation at all. Therefore PLL’s which regulate frequencies, always are PI types of regulators. As I types need a long time to regulate, a D Type is added. (violet). But as it obvious, if not properly adjusted, the output may have some over swing. .A typical example of a regulator that needs an optimum time behavior is an elevator.
. Yet we see, we have 2 corner frequencies and two slopes, -20dB and +20dB per decade and +90 and -90 degree of phase. The precise values can be found using a CAD-program like No.1 Systems ““Analyser” or a graphically bode standart. An similar easy way of computing circuits connected to OP-Amps is used in example 2: If we have a simple input and simple feedback network around an OP-Amp, only the the shorted circuit of the input and feedback resistors must be calculated to find the voltage transfer. As we have seen, the resisters may be complex too. Fig.2 shows the way of looking into the networks using the red dotted lines. This is valid if the corner frequency of the OP-Amp is higher then about 10 times the working frequency. As new designed electronic regulators in most cases are instable, phase correction networks must be used to reduce negative loop phase to reduce oscillation. Often a very small circuit will do the job, but some regulators, as noise free Phase Look Loops, need a complicated electronic filter network, to be stable and reduce noise. In this chapter several simple and complicated loop filters are shown. The shown circuits I have used for years in many feedback circuits to optimize stability and time behavior. Some of this circuits are well known, others are not. #1 Filter Block : Low pass-Circuit with load. This Circuit may be used, to stabilize a regulator and decrease regulators speed. Fig.2 Integrating Circuit and OP-AMP. This differential circuit (D) may be used, to optimize a regulators speed and time behavior. It also can be used as an RF-roll off --linearizing circuit. This is the classical circuit to optimize regulator time behavior for industrial process regulators. (PI D types). As high pass and low pass behavior of a loop filter can not optimize a regulators time behavior and regulation quality, the loop must have an integration behavior, what means one pole at zero F( s ) = 1 / (s) .Whereas the D part may be realized by means of a simple highpas. Now look at circuit of fig 1. The DC: gain goes to infinite, the D part is realized using C2 and the I part is realized by means of C1. Filters in digital modulators must have an roll off and a gain overswing.The circuit of Fig.1 can realize roll off and overswing. 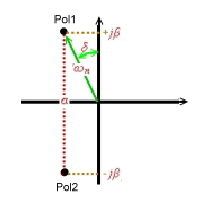 As both corner frequencies are equal, it also can be used to produce positive phase in a regulator feedback. The earning of positive phase is the result of different damping factors. As today’s power transistors are very fast., the loop gain of linear transistor voltage regulators decreases very fast at high frequencies. (More than -40 dB/ Dek.) The result is high frequency oscillation of a simple voltage regulator. A phase correction network must be used therefore.To get stability, the feedback gain must be decreased, by means of an -20dB/Dek slope, until stability is reached. Fig 1 shows the classical circuit. It is important, that the supply voltage is blocked for higher frequencies [MHz range]. 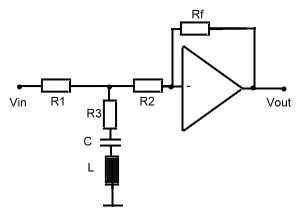 High order filter for PLL-oscillators. As we can see, the OP-AMP for this filter works with maximum Gain, not having a feedback resistor.This leads to minimum output frequency deviation .. 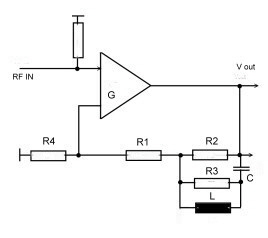 But unfortunately, RF OP-AMPs, need a limitation of Gain using a feedback resistor Fig.3. Under this condition, the second order loop filter- transfer becomes only : Unter this condition ,the regulator is not optimized. 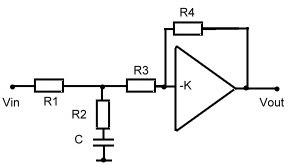 The third order PLL loop filter is almost the same as for a second order filter. Fig.3 . For further readings look to : Electronic Design May 197? 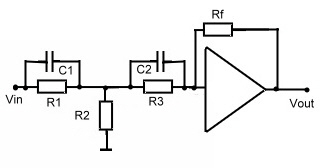 To reject unwanted signals in PLL oscillators, a complex loop filter is necessary. Especially if the Oscillator is used as signal source in digital communications, jittering of bits must be prevented. Fig.5. shoes a filter circuit to realize a clean PLL oscillator. Its an example of series connection of multiplying transfer of regulator blocks. As it was clear, if the OP- AMP has a much higher upper frequency limit than the working frequency, the transfer of the shown circuits behaves like its equations. Yet at RF frequencies, one always are working on the upper frequency limit of OP-AMP’s. Therefore, classical active Filters, will not work proberly. But in case of no filter circuit elements in the feedback of an OP -AMP, only the roll off of the amplifier, may decrease the filter behavior. This circuit may be used as high or low pass circuit to correct the loop gain of a regulator. 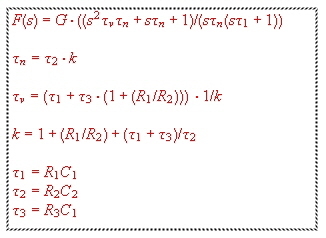 In this equations, normalized frequencies are used : . A high grade filter may have n numbers of the shown poles and zeros which must be realized by means of OP-AMP circuits.